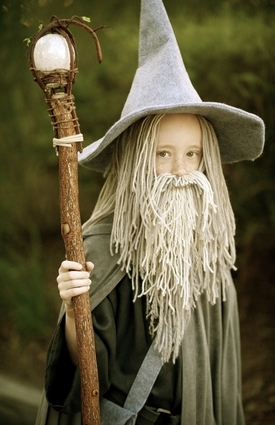 I love all the detail and effort that went into this Gandalf costume. It’s both adorable and impressive, complete with robes, hat, satchel, staff, and let’s not forget the beard. You can see another snapshot of it here, which shows that orb on the top of his staff glows. Amazing work! This costume looks both head- and heart-warming—a-squared knitted the hat and elf ears. 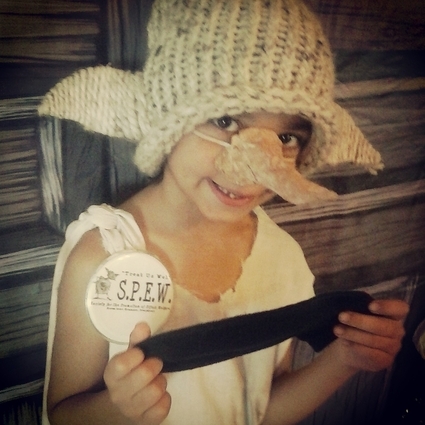 Those of you with good memories (or deep knowledge of Harry Potter trivia) will appreciate the S.P.E.W. button, sock, and pillow-case dyed with tea, to match Dobby’s tea-towel garb early in the series. What a great family ensemble! We’ve got Willy Wonka, Charlie taking a ride in the glass elevator, a lollipop girl, and tiny Violet as a tiny blueberry. Wonka’s coat and hat are spot-on, and Charlie certainly seems to be enjoying himself. I don’t know what was used to make the elevator, but it looks great! If there’s a golden ticket in that Wonka bar, can I come tour the factory with you guys? Starting in high school, where I—like many American teenagers—read The Old Man and the Sea, Hemingway’s face has been a familiar one. And it translates well into the pumpkin medium, too! I’m particularly impressed with the way different “shades” of pumpkin were used, by carving not quite all the way through the pumpkin. Great job! Painted all silver and gold, but retaining it’s pumpkin shape, this is what I always imagined Cinderella’s carriage looked like, as it whisked her off to the ball. I love the gold wreath wheels! As a lover of both cats and the inspiration Kitten’s First Full Moon, this pumpkin has a special place in my heart. It’s even got a moon hanging out above the kitten! The Scrolls of Zndaria pumpkin by zndariasj features some truly excellent carving skills. Well done! I’d also like to commend LynnCoulter on her Audrey II piece. Little Shop of Horrors is one of my favorite musicals, and Audrey II looks great! To all our contestants, thanks so much for joining in! Every one of you did excellent work (and hopefully had some fun in the process), and I look forward to seeing what bookish hauntings you come up with next year! To our winners, congratulations! Look for a profile comment from me shortly with instructions for claiming your prizes! Congratulations! Thank you for sharing your wonderful efforts with us all, and thank you LT for the fun-tastic contest! Wow! Those are all So impressive!